The Trek Collective: New movie on USB and Enterprise webcam! While wondering around on play.com I found a couple of interesting new products: Don't fancy a space consuming DVD or bluray of the new release? 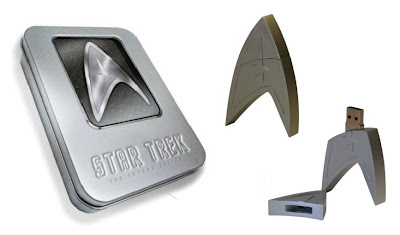 Well you're in luck, as you can now get the film on a USB stick shaped like the Starfleet insignia, and with the movie using up a mere 1GB you get 3GB of useful extra storage space to play with as you please! They're limited edition, so get them while they're hot. 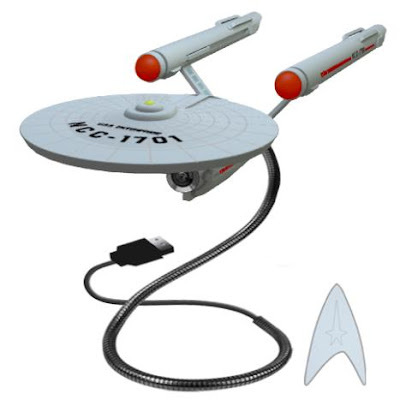 And if you have another spare USB port why not fill it with a webcam shaped like the original USS Enterprise! Complete with LED illuminated nacelles!